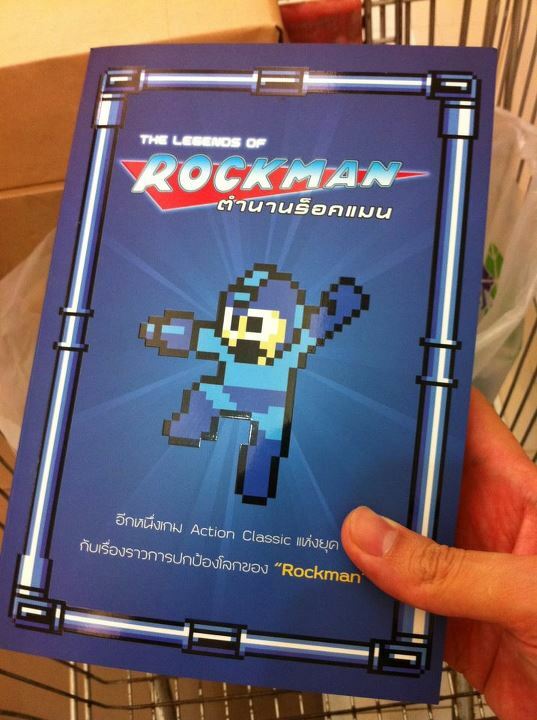 Mega Man fans in Thailand can get their hands on a new book by the Thai Gaming Network. The Legends of Rockman is a thick, 368-page compendium detailing the entire history of the classic series. Every game, every character. No stone is left unturned. From what I've gathered, it's a bit like UDON Entertainment's Robot Master Field Guide with a streak of Pix'N Love flare. Not only does it encompass character and game summaries, but you'll find pages upon pages of information pertaining to the series' development. Furthermore, the games are presented in canonical order. For example, we go from Rockman 4 to Rockman World 3 before touching on Rockman 5. Of course, what's a guidebook without artwork? Each entry is adorned with official artwork and screenshots coupled with statistics and commentary by the authors. You can check out some photos of the book's contents here and here. Doubtful it will ever make the jump to our side of the pond, but if you're interested, you can import a copy from Thai Book World. I'm definitely interested in learning more about the book. If you happen to own it or can translate some Thai sources, let me know! UDON could learn a thing or two. Thanks for the advice, I'm going to order one. Doubtful that it will come over to the west, but it certainly would be great if this did. This sounds ten times better than the Robot Field Guide. I'm from Thailand and a student in the US. I'll certainly grab a copy of this book once I'm home. Saw a preview for half a year already I think. If you need help on some translation, let me know. There's this, AND one for Castlevania too?! Dammit all. "UDON could learn a thing or two."